I am so excited to share with you guys the first ever JustSoChristmas post! I am taking part in blogmas this year, so I’ll be sharing 12 Christmas themed posts. A new post will be going up every second day leading up to the 24th. So make sure you subscribe to my email list to be notified when new posts go up! 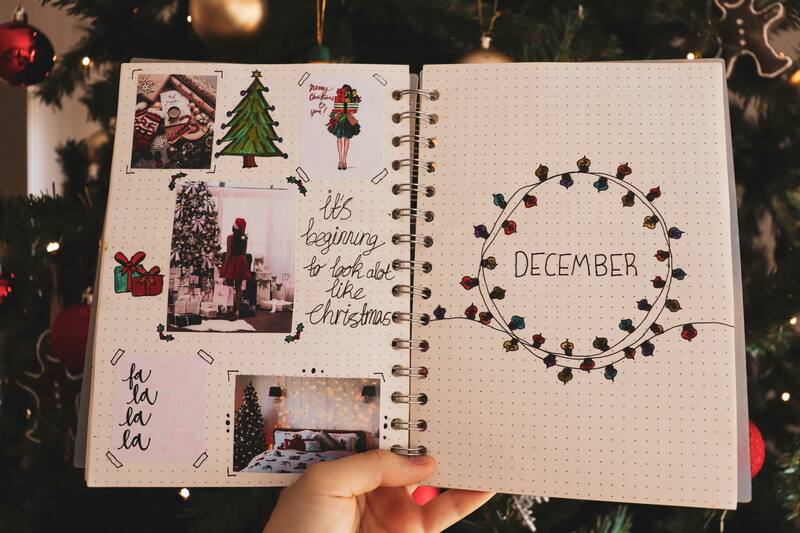 I like to keep my intro pages pretty simple, so for the collage/quote page I just I printed off a few Christmassy photos, wrote my quote and added a few doodles to fill in the gaps. And then for my title page, I drew a Christmas light wreath surrounding December. 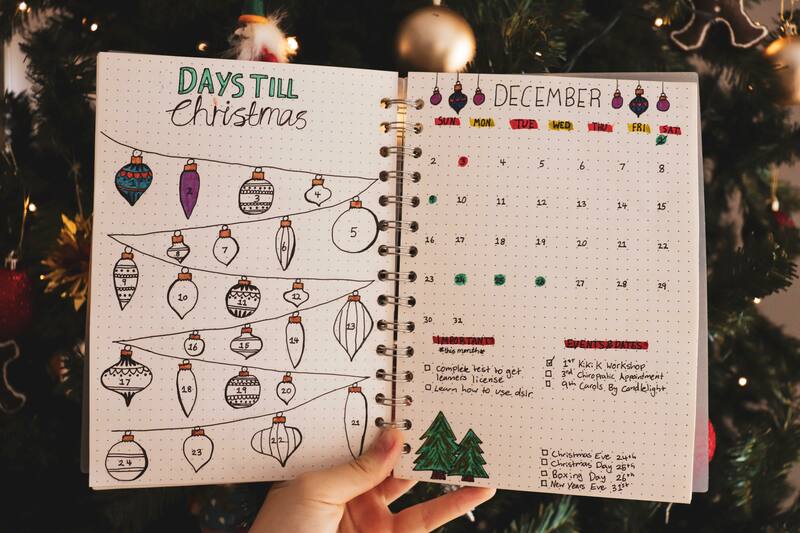 I wanted to include a Christmas countdown in my bullet journal this month. So I drew 24 ornaments hanging off a string. I left some plain and in others, I added more detailed decorations, now each day I can colour in an ornament to countdown to Christmas day. It would not be a JustSoElina bullet journal set up without my trusty colour coded calendar. I love it because its minimalistic and I can fit more than one event on each day. For this month red is doctors appointments and therapies. And green is anything festive or celebration related. I also included specific important events or things going on this month, which I got the inspo from Purely Ella’s Bujo setups. I have also included my regular goals and gratitude page. As I like having a reminder of my goals/aim for that month as well as things I’m grateful for. I decided to make my gratitudes have a festive spin for this month. I’ve also added my Christmas Wishlist in that section which I colour coded. Red is for the top things i would absolutely love to receive and green is for other bits Id also like. In no way do I expect to get any of the things on my wishlist, I only have it as I ALWAYS freeze up when someone asks me what I want for Christmas. So I am hoping this will help me and my shyness when it comes to presents. 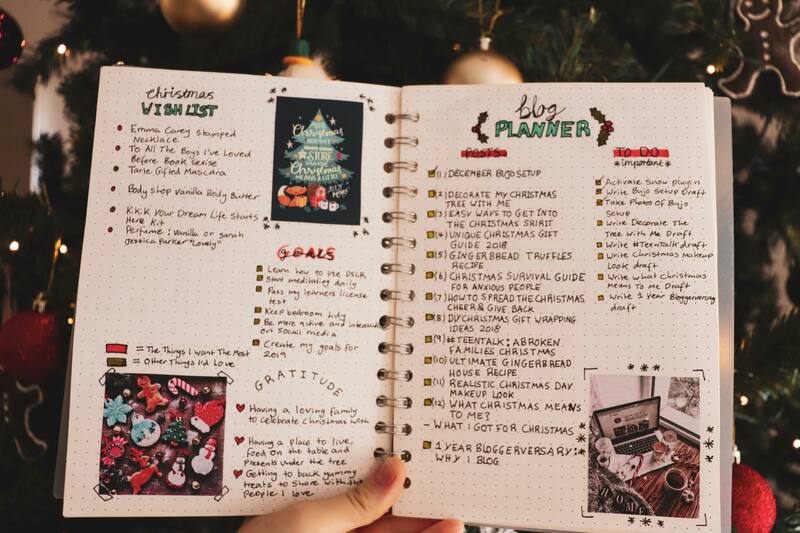 My blog planner is essential in my Bullet Journal, it’s been an absolute lifesaver for planning out the schedule of my blog posts for that month. I also keep a to-do list dedicated to just blog stuff. Since I have so many blog post going up this month for JustSoChristmas, as well as a few others. I created a calendar specifically to keep track of what days I have to upload blog posts. 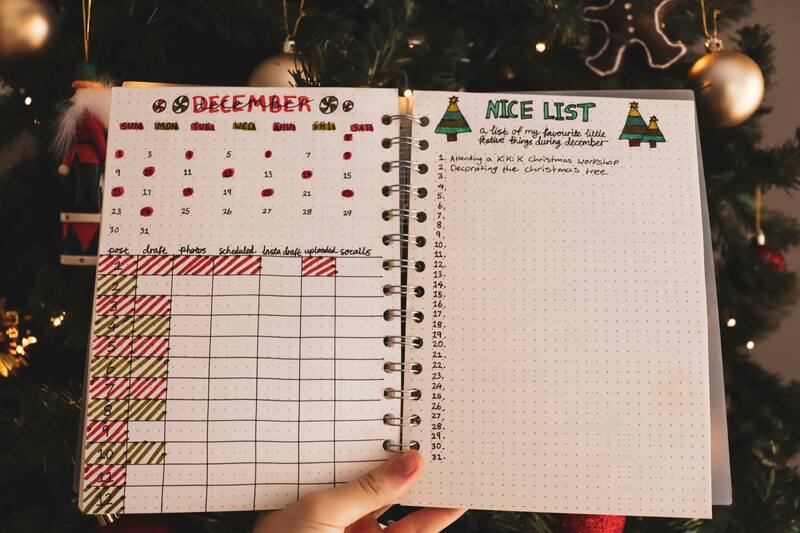 Below the calendar, I have also included a checklist for each JustSoChristmas post to keep track of what I still need to complete for each post. I got the inspiration for the nice list of Pinterest. I thought it was such a cute idea, to write one thing I love or am grateful for each day during the festive season. I can’t wait to look back on this after Christmas to see what things make Christmas so special to me! I really want to send out Christmas cards this year. 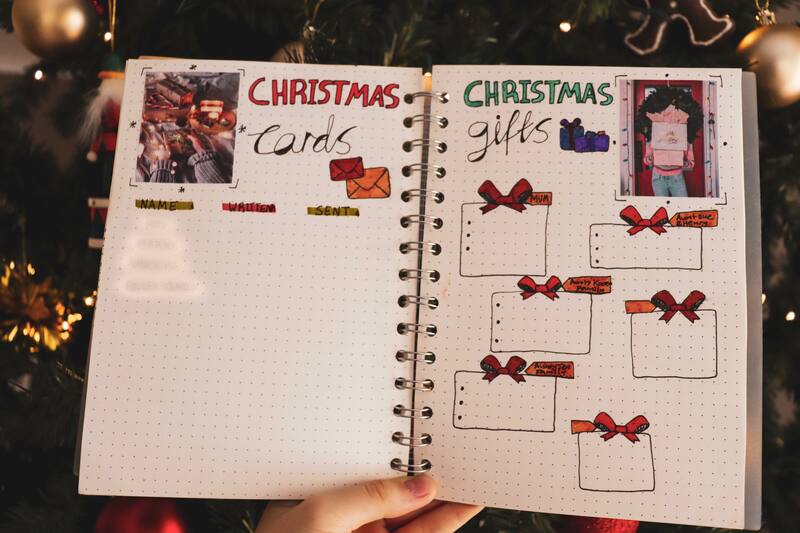 So I created a page dedicated to keeping track of Christmas cards. I included who I’m sending it for, if it’s written and if the cards been sent out. Coming up with Christmas gift ideas can be hard, I like to have a list of Christmas present ideas for people leading up to when I go shopping. I decided to make my list a little cuter by drawing gifts to write my present ideas for each person I’m buying a present for. Thank you so much, you are seriously so sweet! I hope you have an amazing and magical Christmas this year. Thank you Ella, it means a lot since your literally the queen of bujo’s!